Many people get sticker shock when they see the price of cruises, any cruise, but especially the luxury cruise lines. The all-inclusive aspect, the wonderful food, great amenities, larger cabins, smaller ships, and superb service are extremely enticing, but the price point makes many cruisers turn to the premium lines. Their price points seem so much more reasonable. Rather than looking at what you pay to get on the ship, look at what you pay to get off the ship. 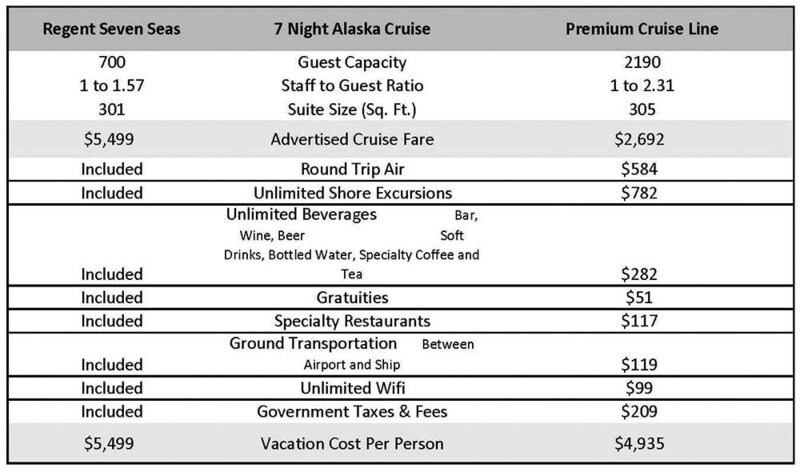 The cruise fares may vary widely but consider the additional costs you would have on the premium lines, and they do add up. In the chart below, I offer you an example of comparing a Regent Seven Seas cruise with a similar itinerary on a premium line. Yes, the luxury line is still more expensive than the premium line; however, the delta in price point is not as vast as you may have originally thought. There is a difference in service. Oh yes. You are treated like the VIP that you are. Bliss. What is not to love? When you think of what you pay for what you get, it’s a really good value. The luxury lines offer true luxury accommodations, transportation to interesting destinations, and attentive service. With the high level of service, you may wonder how often you need to reach you’re your pocket to tip the staff. No worries, your gratuities are already covered in your fare on lines such as Azamara, Crystal, Paul Gauguin, Regent, Sea Dream, Seabourn and Silversea. You’ll get three delicious gourmet meals (Michelin star level meals in certain cases), snacks, soft drinks, specialty coffees, and premium wines and alcohol. The really cool thing is that you can have them all delivered to your room! Yes, you can. On those days that you just feel like sleeping in or lounging in your suite for the evening, your gourmet meal and favorite beverage will be delivered to you. For free. How convenient is that? Some of the luxury lines offer shore excursions as part of your fare. Even if they don’t include every excursion in the fare, they will host complimentary outings, concerts, and cultural events during certain segments of the cruise. What I really love about the small to mid-size luxury lines is the opportunity to meet your fellow passengers. -No flights, trains, buses, or rental cars to get to your next destination. -You unpack once, and you’re done. -You have more time to relax. -Enjoy your sea days and catch up on your reading. -Visa, passport, and entry into other countries is minimal and handled for you. -You’ll have plenty of choices for sight-seeing and entertainment. -Gourmet food and premium beverages. -Stay fit on board the ship and use the gym, take classes, play paddle ball, or walk the track. -Alternatively, take advantage of the port cities for walking, jogging, swimming or other exercise activities. -You get to learn about new countries, cultures, customs and food. -If you enjoy a drink or three, no need to drive home. Just walk to your stateroom after a night of entertainment. -Share your adventures with your stunning photos on Instagram. -You have the opportunity to meet new people and make lasting friendships. -No difficult decisions, except which restaurant is on the schedule for dinner. -No need to drag your pocketbook or wallet anywhere. Keep them in your stateroom safe. This is an opportunity to have many deeply personal and memorable moments that you cherish for a lifetime. Many people believe that a luxury cruise is out of reach, but it really isn’t if you think about it. The extras that are not included in your fare on a premium line can really add up to almost the cost of the luxury line. It’s not about what it costs to get on the ship, it’s what it costs to get off. A luxury cruise offers a truly relaxing experience that will make you feel like a million bucks. 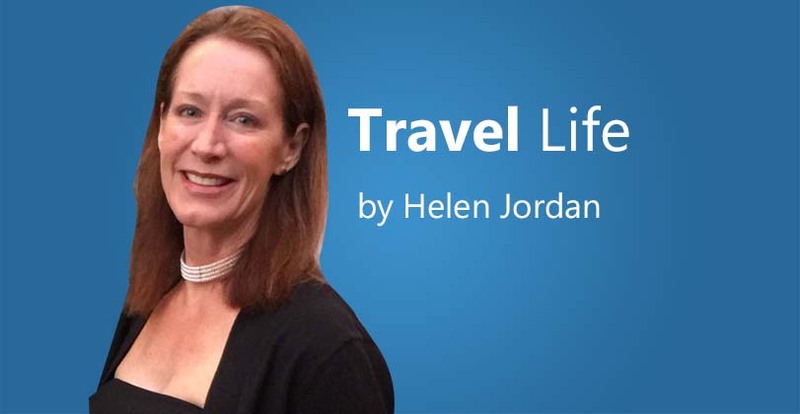 Helen Jordan is the owner of Jordan Luxury Travel, an independent affiliate of Brownell Travel, a member of Virtuoso. She can be reached at helen@jordanluxurytravel.com.